Professional quality hairdryers are the favourite ones to perform at best one’s own job. The ON HAIR 2018 of Bologna confirms to be an expected and appreciated Italian event for the hairdressers. On Nov. 25th- 26th in Bologna, two busy days on discovering the latest hair fashion trends and the related techniques, learning some tricks to able to satisfy one’s own customers and following the live shows of the most important hairstylists and, above all, looking up brand new products to be used in one’s own hair salon. Among them, the main tool which is mainly used by hairdressers every day for long time: the hairdryer, which for the above mentioned reasons must be high quality, professional and very technological. Just as those Parlux has been creating, experimenting and producing for over 40 years to the hairdressers’ service. With this spirit, Parlux successfully attended at the 2018 edition of ON HAIR, Bologna. 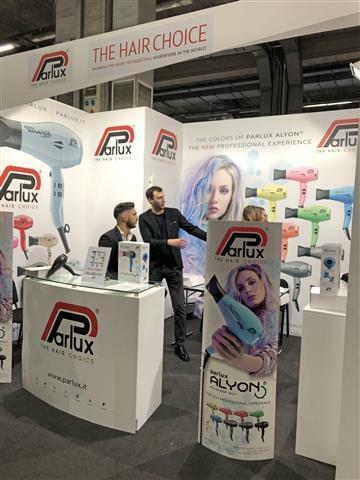 Its booth, very lively and colourful as the various coloured versions of its latest hairdryer Parlux ALYON®, caught the attention of visitors who could be able to test this model on place, verifying its power and lightness. New technological devices feature this model: the innovative K-ADVANCE Plus® motor, the Air Ionizer Tech ionic system (a device which emits negative ions to obtain bright, soft and shiny hair) and the new HFS (Hair Free System – patent pending) which collects the hair leaving the hairdryer cleaner and efficient for long time. The Parlux products represent the best choice for the hair professionals which always require reliability, safety and durability for any tool they are using every day.